The 1997 edition of the American Institute of Architects Standard Form of Agreement between Owner and Architect, AIA, B141-1997 fundamentally changes the role of the Architect regarding responsibility for controlling construction costs. New section 2.1.7.1, is for the most part, a restatement of old Subparagraphs 2.2.5, 2.3.2, and 2.4.3, with one critical difference. The prior Subparagraph 2.2.5, obligated the Architect to provide the Owner with a preliminary estimate of construction costs at the end of the Schematic Design Phase. Prior Subparagraphs 2.3.2 and 2.4.3 obligated the Architect to provide the Owner with adjustments to its preliminary estimate of construction costs at the end of the Design Development and Construction Document Phases, respectively. The last sentence of the new Section 2.1.7.1, however, states: “if at any time the Architect’s estimate of the Costs of Work exceeds the Owner’s budget, the Architect shall make appropriate recommendations to the Owner to adjust the Project’s size, quality or budget, and the Owner shall cooperate with the Architect in making such adjustments.” This sentence causes a fundamental change in the architect’s role and responsibility. Previously, the Architect merely advised the Owner of adjustments or changes in its preliminary estimate as the Project progressed. If the costs of the Project grew, the Owner had several options. However, the Architect was not responsible for making recommendations to bridge the gap between estimated costs and the Owner’s budget. More importantly, the Architect would be compensated for preparing changes to meet the Owner’s budget not caused by his own failure to follow the Project program. (3) The Architect is bound to provide redesign services for free notwithstanding the fact that the estimate of the costs of work may have increased due to factors that are totally unrelated to the Architect’s services. Thus, this one new sentence appears to be a representation that the Architect will now make all modifications necessary to its documents as may be necessary to bring them into conformance with the Owner’s budget through the completion of Construction Documents. The results of this sentence could be catastrophic for any Architect retained on a large complex project, as well as for smaller architects working on more modest projects. Providing redesign work, essentially for free, is a quick path to financial ruin. Why this sentence now appears in a standard AIA document is at best perplexing. This major problem is amplified significantly when the Architect also retains the consultants on a project and all their services are also provided for free or, in the worst case, the unwitting Architect has to pass this unreasonable burden on to his or her consultants and ends up in the preposterous situation of not only performing substantial work for free, but being obligated to pay the consultants for the same work it is already losing money on. What is also very troubling about the new sentence at the end of new Section 2.1.7.1 is that it assumes that the primary reason that the Owner’s budget has been exceeded is due to the work of the Architect. This is often not the case, particularly on large, sophisticated projects. Project cost escalations can be driven by any number of external factors (e.g., poor estimating by the general contractor or construction manager, and escalation in the cost of labor or materials, to name but two of many). In addition, the Owner’s budget and its underlying assumptions may be incorrect or unreasonable. However, in the past, if that was the case, the Architect’s additional work in revising its plans and specifications, and those of the consultants, would be borne by the Owner unless it was solely the Architect’s or the consultant’s professional negligence which caused the Owner’s budget to be exceeded. In addition, the Architect now may be responsible for the risk of the escalation in the cost of labor and materials from the inception of its services through the completion of the Construction Documents Phase. In the interest of thoroughness, it should be noted that Section 1.3.3. “Changes in Services,” gives the Architect an argument that it should be compensated by the Owner for the redesign to bring its cost estimates in line with the Owner’s budget through the Construction Documents Phase. This argument is not strong, however, for a number of reasons. If the Architect “recommends changes” to be initiated to meet the Owner’s budgetary requirements, this does not neatly fit into a “Change in Service” as defined in B141-1997. Next, Section 2.1.7.1 contains no cross-reference to Section 1.3.3, and the legal construction of the new contract to read section 2.1.7.1 to include Section 1.3.3. is, in my opinion, a weak argument. At best, the Architect is left with a difficult legal and factual debate which by its nature generally favors the Owner. Thus, the simple inclusion of the new sentence at the end of Section 2.1.7.1 has indeterminate ramifications which may well impose catastrophic obligations on Architects working on large projects. Was this the intended effect of this language? Of course not. Will it be the actual effect? Perhaps. And that is a frightening thought. About the Author: Michael DeChiara is a partner in the law firm of Zetlin & DeChiara, LLP, whose practice emphasizes the representation of design professionals. For more information: 801 Second Avenue, New York, NY 10017; (212) 682-6800. Editor’s Note on this Article: by J. Kent Holland, Jr. While pondering the impact of these clauses of the new AIA form, I came across Mr. DeChiara’s article in his law firm newsletter and decided it would be good to share with the readers of ConstructrionRisk.com Report. The concerns he raises strike me as reasonable, but I don’t imagine it was the intent of the AIA for the language to be interpreted the way it has been presented in this article. It would be interesting to get the AIA’s view about this. The problem is, however, that with reasonable people disagreeing over the intent of the language, it is entirely possible that a court would apply the principle that the party that drafts the contract is responsible for any ambiguity. This would mean that an owner’s more strict interpretation could be applied against the architect even if this was not the intent of the architect or AIA. What makes the clause more ambiguous is the fact that an increasing number of contracts that are being drafted by project owners are specifically requiring the architect to take responsibility for performing additional design services without compensation when there are construction cost overruns. An example of such a clause is one that I was just asked to comment on for a client. It reads as follows: “If the construction Budget is exceeded by the total of the lowest responsive and responsible bids and any legally negotiated prices for the Project, the Department shall, at their option … [have several choices of action]. 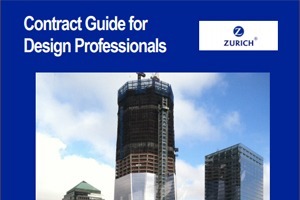 If the Department adopts options (2)(3) or (4), the Consultant shall modify the Approved Program Requirements, the Project schedule and the Contract Documents and cooperate in any necessary bidding or negotiation WITHOUT ADDITIONAL COMPENSATION.” This states in unambiguous language what some owners will assert has been stated by the new AIA form, whether inadvertently or not. With the current hot construction market, it is unreasonable for an owner to expect an A/E to assume responsibility for cost escalations in contractor’s bids that are beyond the A/E’s control. It is unwise for an A/E to agree to such liable, and to the extent that they suffer costs as a result, their professional liability coverage will not cover those costs as damages unless caused by negligence. Unfortunately, the contract language is creating contractual liability and potential guarantees that are excluded under the typical professional liability policy.